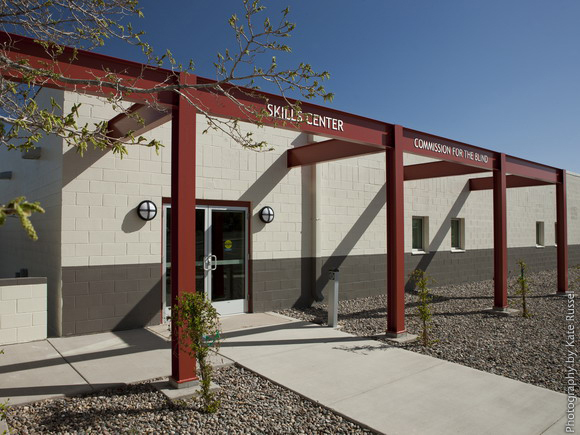 Earlier this summer, members of the Board of Directors of the New Mexico Commission for the Blind (NMCFB), dedicated its new, state-of-the-art Skills Training Center located in south Albuquerque. A former 6,000 square-foot sewing area attached to the larger Albuquerque facility was transformed into a warm, comfortable training center where life skills can be taught to NM residents who are losing their vision or are blind. Working closely with the State of New Mexico Property Control Division (PCD), BFA+D provided full architectural services for the renovation. From programming through construction administration, our team enjoyed its engagement with the Client, including members of the Commission Board, staff, and NMCFB clients. Historically, the NMCFB leads the nation in providing training and other services to the visually impaired. As expressed during the opening event, the Commission worked tirelessly to obtain the funding and support necessary to improve the Albuquerque facility and expand services to its client-base. With an appropriation by the New Mexico State Legislature championed by Senator Jerry Ortiz y Pino of Albuquerque, the renovation began construction in fall 2011. An incredibly interesting project, we were able to incorporate many design elements that most of us don’t think about on a day-to-day basis. Often blind people, or people who are losing their vision, have greater development of other senses so that they are more sensitive to noise, light, and aural clues. This means they can often tell the difference when walking into a space that has a high ceiling or is large or small. In addition, for those who are visually impaired yet not blind, contrast of colors and how daylight (windows) and room lights are handled to reduce glare or hot spots becomes highly important in how folks distinguish spatial elements from each other. It was fascinating to be able to design with new thoughts about how the corridors and different classrooms will sound and how the colors and textures of the materials selected will be differentiated by both touch and visual clues. New interior spaces include two kitchens, classrooms, a computer lab, library, office space, and communal-use areas for employees and clients. Exterior improvements include a new entry and landscaping. Barbara stated, “We value our relationship with the State of New Mexico and are grateful for the opportunity to work with PCD and the NMCFB to create an integrated design for the Skills Training Center. Knowing the risk of blindness rises as our general population ages it is comforting to know that an organization such as NMCFB exists”. Please click on Projects to view images of the transformation (and to see work on the NMCFB Alamogordo renovation started in July 2012). For more information about this project, please contact us at info@bjfelix.com. How we Love our Northeastern University Interns! © 2019 Barbara Felix Architecture + Design All Rights Reserved.